My first week of General Assembly's HTML/CSS classes are complete and I've lived to tell about it. In fact, it was fun. The first part of class we spent doing the expected syllabus review and awkward, but necessary, exercises to get to know everyone who is taking the class. There are 18 of us, and there are a wide range of careers and reasons why individuals chose to take the class. There are project managers and strategy planners that want to be able to communicate better with their developers. There's a guy who works at a nonprofit who wants to be able to help update his organization's website. Some people just want to change careers completely. And there are a couple designers like me who want to be able to provide more than just comps for their designs. The class is taught by Sarah Holden. She is really sweet and understanding of all us newbies, and baked us the best chocolate chip cookies I have ever had. We also have a TA, Moe Alkhafaji, who will help anyone in class in need of extra explanations on any material Sarah has covered. We have a set of slides for each class that we can download with some cheat sheets on important topics. There's also some “starter code” that Sarah gives us to work through in class as practice before we're on our own with our weekly assignment. I am going to include screen shots of the things I have worked on every week so you can see how I (hopefully) improve throughout the course. The first lesson focused on the basics of html. 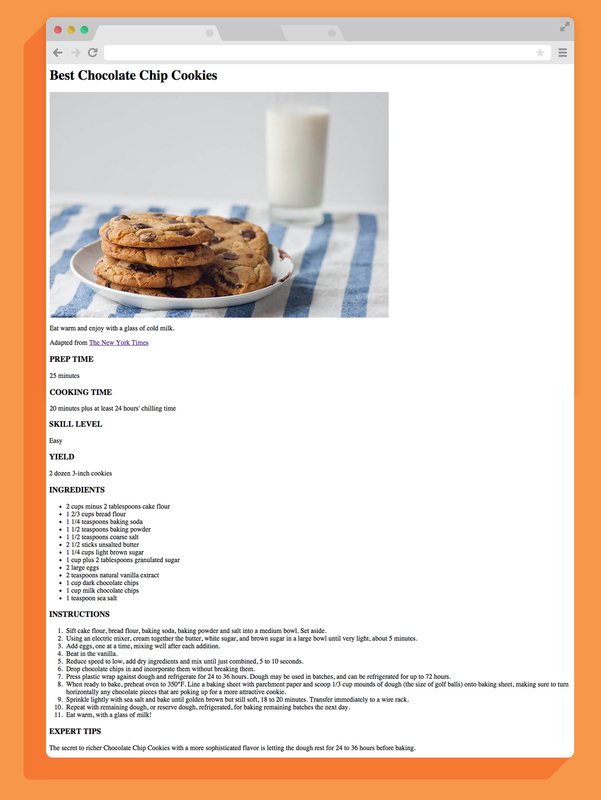 The starter code we worked on in class was creating an HTML file of Sara’s chocolate chip cookie recipe. We used simple tags to create the recipe and, while it looked like crap, I was pretty proud when I pulled the file into my browser to see it all structured how I wanted it to be. This crappy looking file made me excited for where the rest of the term will take me. Our second class started to introduce some CSS basics. This is what I was most excited to start learning. 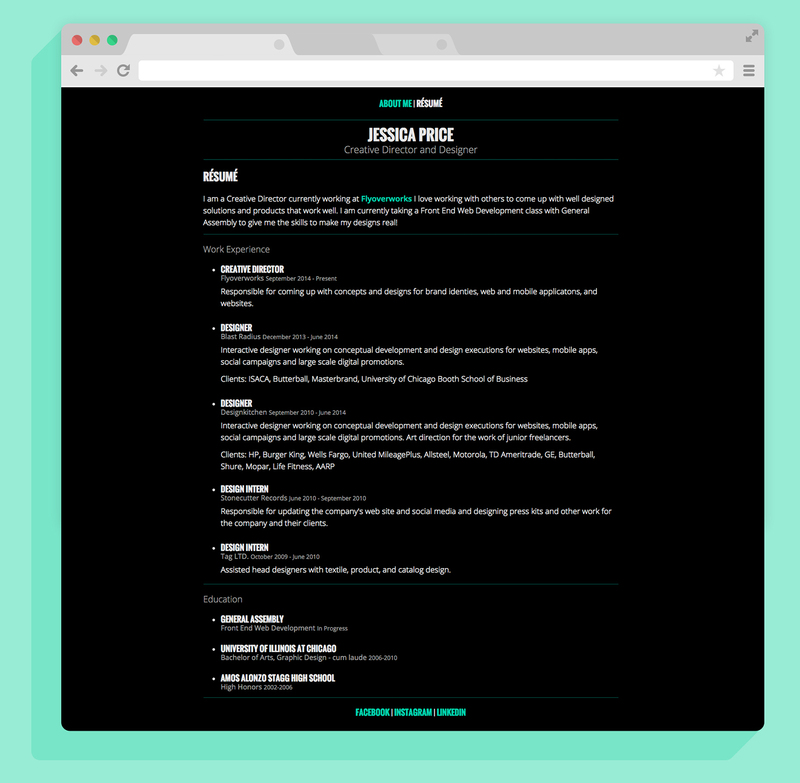 I wanted to turn my ugly basic looking HTML documents into pages that looked like a designer actually worked on them. Our starter code for this class was working on an about page and resume for a fictional person. After writing some CSS syntax and linking it to my HTML document, I started seeing my boring page spruce up with color, font, and spacing changes. My OCD started kicking into gear. I felt drunk with power. 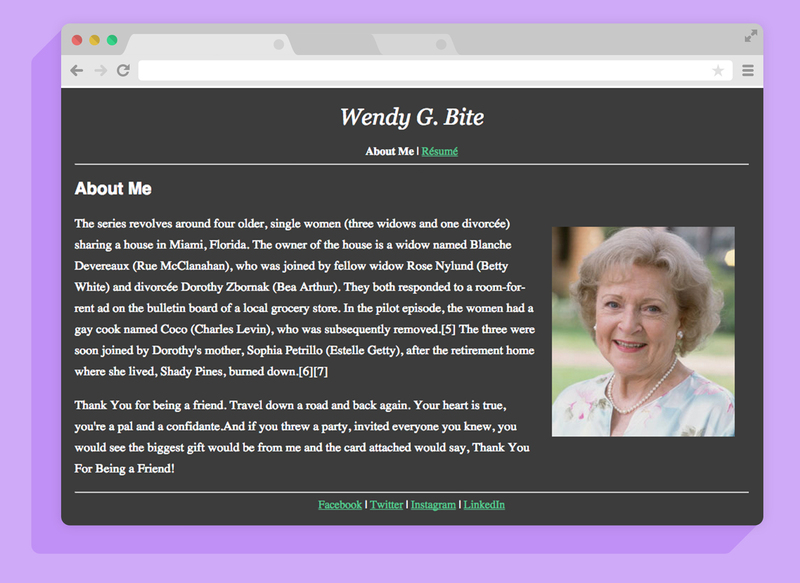 The homework for the week was to create a short "about me" and resume page for ourselves and incorporate the HTML mark ups and CSS styling we had learned. We got extra kudos if we included a web font and pseudo-class. I focused on trying to keep my code neat, and tried not to get lost in the possibilities of everything I could tweak with CSS. I found it almost therapeutic to write these lines of code and see the links go where they were supposed to and the changes happening each time I refreshed my browser. I looked up how to link in some Google fonts, so I wasn’t stuck with what the browser gave me, and added some hover states for my links – to give it a little flare. Surely lame to the surly veterans, but I really enjoyed working on my basic pages. It may be because this is all so new and fresh to me, but I can’t help feeling proud of each new file I make. Working with developers over the years, I've heard them talk about the things I'm learning so many times. Understanding how they relate and work together is really gratifying. I know that all of this is going to be so useful as I continue to learn and incorporate it into my job. I wish I had learned all of this sooner, but I'm really excited that I have the chance now. We are never too old to learn new tricks.